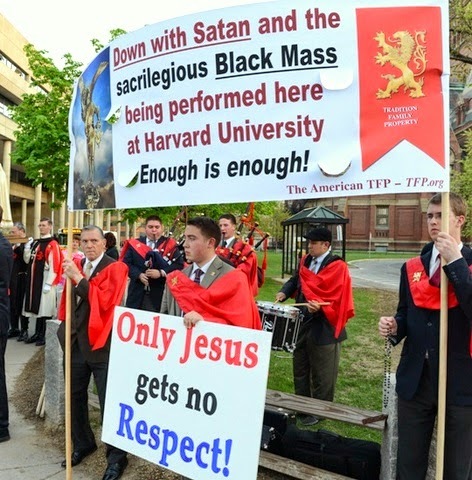 What few people thought even remotely possible happened: The "satanic black mass" at Harvard University was unexpectedly canceled on May 12. A grave sacrilege was averted. Lucifer lost. God won. The Virgin Mary and Saint Michael the Archangel were victorious against this open and brazen attempt to mainstream the darkest sort of evil at America's oldest Ivy League university. But why was a black mass even considered in the first place? Why did a student club invite the Father of Lies to sow darkness in Harvard's renowned halls of higher learning? When did sacrilege against God become an "educational" enterprise? And what real and effective measures will Harvard officials now take to ensure that something so outrageous does not reoccur in the future? In the middle of final exams, when studies are more intense, many Catholic students at Harvard dropped what they were doing and sprung into action to defend the Faith. Stand With Harvard Catholics is a web page that records their efforts to stop the black mass on campus. Among well-written protest letters, statements and interviews, the group collected and later delivered 80,000 petitions to Dr. Drew Faust, president of Harvard University, calling on her to cancel the sacrilege. "It was with great dismay that we learned that the Harvard Extension School’s Cultural Studies Club is hosting a 'Black Mass re-enactment' in the basement of Memorial Hall on Monday, May 12th," the petition states. "We are offended and outraged this event has been permitted to take place at Harvard... We demand that President Faust and the Harvard administration speak out against this event, and do all in their power to disband it." In addition to the 80,000 petitions gathered by Harvard students, TFP Student Action collected 46,000 protest petitions and CitizenGo got another 42,000, bringing the grand total to 168,000 petitions in a relatively short period of time. Numerous phone calls and personal email complaints were also sent to Dr. Faust. Not content with merely signing a petition, Catholics in Boston, clergy and faithful, organized a public Eucharistic Procession from MIT (Massachusetts Institute of Technology) to Saint Paul's Parish located at the edge of Harvard's campus, where a Holy Hour was held before Our Lord in the Blessed Sacrament in reparation for the planned sacrilege. Thousands turned out for the procession which made its way to Saint Paul's. The Church was so full that there was standing room only and the faithful spilled out onto the sidewalk. Meanwhile, TFP Student Action volunteers held a prayerful protest in front of Harvard's Memorial Hall, the location where the black mass was scheduled to occur. The response was not limited to Boston, but stretched across the nation and extended well beyond our boarders. Churches, prayer groups, families and individuals registered their prayerful protest by spontaneously organizing acts of reparation of their own. In fact, TFP Student Action received messages from Catholics in Argentina, Australia, Canada, China, Croatia, England, France, Georgia, India, Italy, Mexico, Netherlands, New Zealand, Philippines, Poland and Uganda, to mention some. "Do you know I am from Macao (far, far away from your country). I am a Chinese. Glad to join all of you to resist the sacrilegious action. "We stay firm. Stand still waiting for HIS involvement. Our rosary non-ceasing offered adoration non-stop." "In Raleigh at 7:15 PM, I started the Miraculous Medal Novena as I do every Monday evening at Our Lady of Lourdes Catholic Church. "As we began praying, young people who came to pray the Rosary due to the happenings at Harvard started filing in and joined us. We said the Rosary, the Divine Mercy Chaplet, and the Chaplet of St. Michael for our country and the protection of the young students at Harvard. We asked Our Blessed Mother to do something to stop the black mass from taking place. She sure did a good job, thank God." "I'm in tears of joy as I watch the video you sent. It's really a sign of victory for the Holy Eucharist, for America and for all Catholics around the world!" Hundreds upon hundreds of messages like these poured into TFP Student Action inbox, demonstrating how a worldwide reaction of prayer and protest against the proposed black mass at Harvard had been set in motion. "God heard the cry of His people!" Harvard officials had invoked "academic freedom" to justify the heinous black mass on campus and initially displayed little interest in reevaluating the outrageous decision to invite satanists to revile Our Lord. As the day of the event approached, there was no talk of canceling the sacrilege. On May 12, Harvard was a whisper away from dethroning God by giving Satan a platform to propagate evil and sin. For that reason, at least on a human level, God-fearing Americans were bracing for the worst, yet turning to the power of prayer and hoping for the best. Suddenly, only hours before scheduled, the black mass was canceled. There is no doubt that without a special grace, this victory would have never been achieved. The news was received with great joy by everyone who loves God. Summing up this great victory, a TFP Student Action supporter aptly exclaimed: "God heard the cry of His people!" Yes, how true. Let us thank Him for this victory and continue to pray that, as a nation, we remain forever under God.